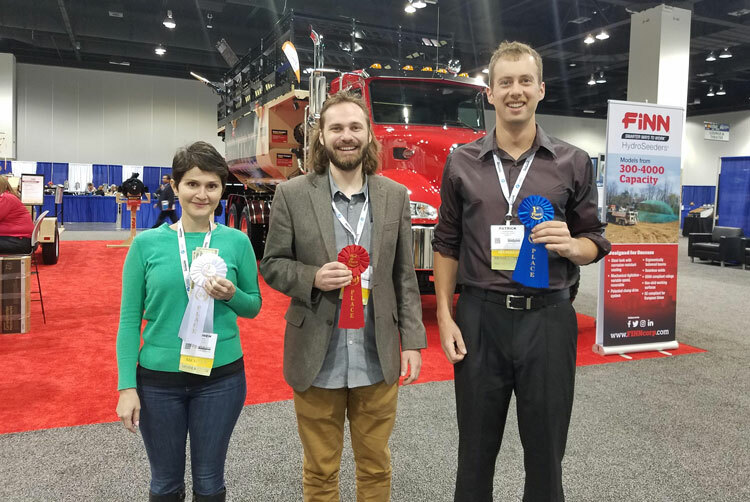 Denver — The International Erosion Control Association Region One (IECA) announced winners for its poster contest at the 2019 IECA Annual Conference and Expo held in Denver in February. The first-place winner was Patrick McGunagle who presented “The Ecological Context of Erosion Control Features, Natural Disturbance Response and Implications for the Built Environment in Forest Lands after Severe Wildfire” poster. Second place winner, Kyler Stevenson presented the “Modeling Urban Hydraulic Processes after Channel Restoration in San Diego, CA in US Army Corps of Engineers (USACE) Hydrologic Engineering Center River Analysis System (HEC-RAS)” poster. Third place winner, Tahmineh Sarabian, presented the “Reliable and Cost-Effective Maintenance for Permeable Interlocking Concrete Pavement (PICP)” poster. McGunagle, a graduate student at Montana State University, summarized data and experiments from more than 50 years of USDA Forest Service and DOI Bureau of Land Management studies on ecosystem response to wildfire across a variety of spatial and temporal scales and regional characteristics. Post-fire treatments are applied to affected areas based on environmental goals, budget, ecosystem response, erosion prevention, resource benefit and aesthetics. The poster provides a summary to a myriad of investigations and further analyzes the ecological context of treatments to promote building ecological resilience into disaster management plans, especially in areas of the built environment at risk for repeated exposure to disturbance scenarios. Stevenson, a graduate researcher – civil engineering, water resources at San Diego State University, focused on research for USACE HEC-RAS models to observe the effects of vegetation restoration in the riparian and stream areas of Alvarado Creek, a tributary of the San Diego River Watershed in California. The poster emphasized the importance of field-based data in validating and calibrating models to accurately predict channel responses in addition to understanding the effects of vegetation restoration to mitigate flooding in urban environments. Sarabian, a professional engineer/master student at the University of Toronto, looked at cost-effective and reliable maintenance techniques for PICP. The poster identified reliable methods for surface cleaning to enhance the infiltration rate and identify appropriate maintenance for PICP. In addition, the results provided guidance to manufacturers on maintenance options available for the systems to enhance long-term performance. “The poster presentations give students and young professionals the opportunity to make a name for themselves in the industry. Poster presenters engage with conference attendees through active knowledge sharing. This is a great networking benefit for IECA University Partners students,” concluded Fetherolf.